This might be one of the first advertisements for Rohde & Schwarz (R&S) test and measurement (T&M) products to appear in a U.S. publication (December 13, 1965 Electronics). A brief search for earlier instances did not turn up anything prior to 1965. Please contact me if you have seen one. R&S, as you probably know already, is now a major player in the communications T&M world. 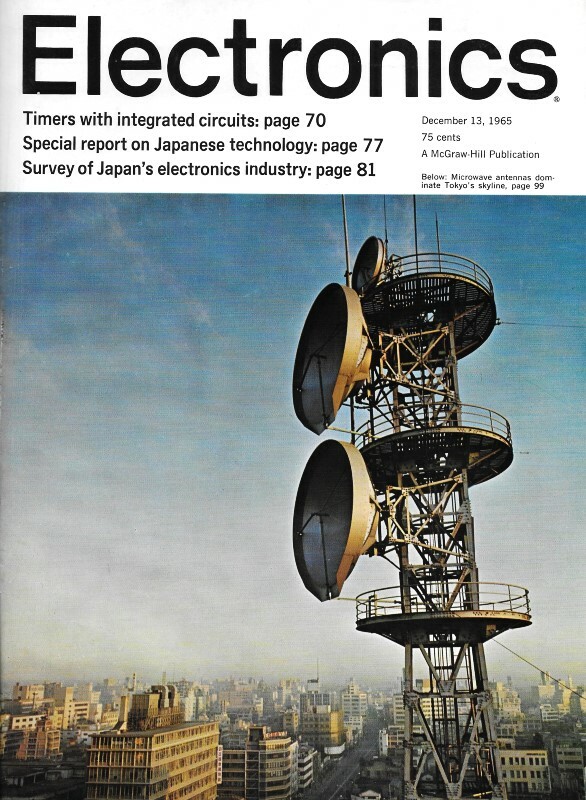 Hewlett Packard (HP) of course was one of the largest - if not the largest - maker of spectrum analyzers, network analyzers, noise figure test sets, modulation generators and analyzers, signal generators, o-scopes, etc., up through about the 1980s - maybe into the 1990s. 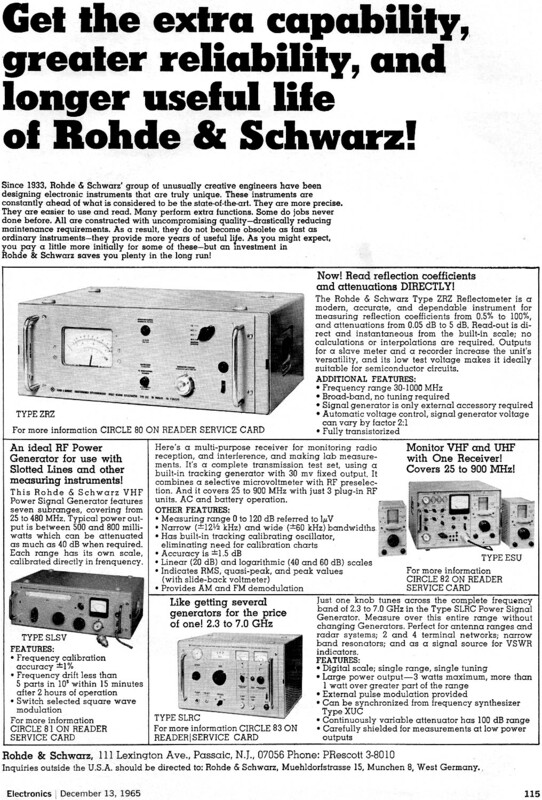 Once the cellular and wireless everything markets took off, Rohde & Schwartz test equipment (TE) began appearing on lab test benches more and more frequently. Engineers and technicians quickly learned to appreciate the new advanced features that older industry stalwarts were slow to adopt and incorporate. Then, in the early 2000s, HP decided to divest its TE market into a new company with a weird, totally unfamiliar name, leaving a lot of customers with strong brand loyalty feeling abandoned (gotta admit I was one of them). The switch to other brands was made much easier from then on, and, at least where I worked at the time, labs and production test areas began mutating in color from gray to light blue. Get the extra capability, greater reliability, and longer useful life of Rohde & Schwarz! Since 1933, Rohde & Schwarz' group of unusually creative engineers have been designing electronic instruments that are truly unique. These instruments are constantly ahead of what is considered to be the state-of-the-art. They are more precise. They are easier to use and read. Many perform extra functions. Some do jobs never done before. All are constructed with uncompromising quality - drastically reducing maintenance requirements. As a result, they do not become obsolete as fast as ordinary instruments - they provide more years of useful life. As you might expect, you pay a little more initially for some of these - but an Investment in Rohde & Schwarz saves you plenty in the long run! Now! Read reflection coefficients and attenuations directly! The Rohde & Schwarz Type ZRZ Reflectometer is a modern, accurate, and dependable instrument for measuring reflection coefficients from 0.5% to 100%, and attenuations from 0.05 dB to 5 dB. Read-out is direct and instantaneous from the built-in scale; no calculations or interpolations are required. Outputs for a slave meter and a recorder increase the unit's versatility, and its low test voltage makes it ideally suitable for semiconductor circuits. An ideal RF Power Generator for use with Slotted Lines and other measuring instruments! This Rohde & Schwarz VHF Power Signal Generator features seven subranges, covering from 25 to 480 MHz. Typical power output is between 500 and 800 milliwatts which can be attenuated as much as 40 dB when required. Each range has its own scale, calibrated directly in frequency. Here's a multi-purpose receiver for monitoring radio reception, and interference, and making lab measurements. It's a complete transmission test set, using a built-in tracking generator with 30 mv fixed output. It combines a selective microvoltmeter with RF preselection. And it covers 25 to 900 MHz with just 3 plug-in RF units. AC and battery operation. Monitor VHF and UHF with One Receiver! Covers 25 to 900 MHz! Just one knob tunes across the complete frequency band of 2.3 to 7.0 GHz in the Type SLRC Power Signal Generator. Measure over this entire range without changing Generators. Perfect for antenna ranges and radar systems; 2 and 4 terminal networks; narrow band resonators; and as a signal source for VSWR indicators. Inquiries outside the U.S.A. should be directed to: Rohde & Schwarz, Muehldorfstrasse 15, Munchen 8, West Germany.